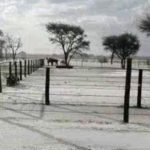 Andries Jooste, the owner of Farm Wilhelmshöhe north of Gobabis exclaimed with wonder at the amount of hail that fell on his property on Wednesday during an intense hail storm. He said his farm near Drimiopsis resembled farming areas of the United States of America after heavy snow fell. Jooste worked on farms in the US as a younger man. He said as much as 100 millimetres of rain fell in the span of Wednesday afternoon that some of his cattle in different camps were standing in water deep enough to reach their bellies.